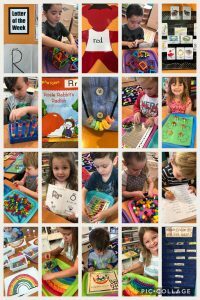 We have been Rockin’ it with Letter Rr in our Room!! We rowed our boats with Rocco the rower rowing in the rowboat, rainbow colors, race cars, reading, torn paper rainbows, Ritz, the rainbow song as we made rainbow necklaces with fruit loops, rocks, rabbits as we get ready for Easter, races, rulers, red, rockets and so much more! !